The H-34 (France) is a rank V French utility helicopter with a battle rating of 9.0 (AB/RB/SB). 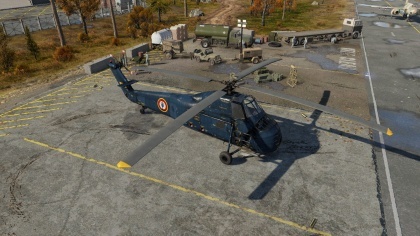 This helicopter was introduced in Update 1.87 "Locked On"
The Sikorsky H-34 was manufactured as a piston-engined military helicopter originally intended for anti-submarine warfare, however, it also has seen service as a medium transport helicopter and as a combat helicopter. This tail dragging helicopter has the radial reciprocating engine mounted in the nose of the aircraft with the driveshaft traversing through the cockpit. Initial flight of this helicopter took place in March 1954 and the first to enter service with the U.S. Navy took place only six months later. The U.S. Army and Marine Corps also placed orders for this helicopter in 1955 and 1957. Other designations of this helicopter include SH-34, UH-34 and CH-34. For transport purposes, this helicopter can be configured to carry between 12 to 16 troops or if utilized in the role of MedEvac, up to eight stretchers. French aviation company Sud-Aviation assembled a total of 135 H-34’s built in the U.S. along with a total of 166 H-34s produced by Sud-Aviation under license from Sikorsky for use in the French Air Force, Navy and Army Aviation (ALAT). 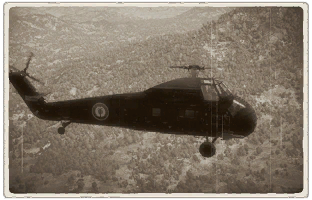 Due to the ruggedness of the H-34, it had an impressive track record under French command in the Algerian War where it garnered over 190,000 flying hours evacuating French troops from combat locations, including many nighttime operations. Production of the H-34 terminated in 1968 by Sikorsky after building a total of 1,821 of these helicopters. Describe the helicopter's suspended armament: additional cannons under the winglets, any bombs, and rockets. Since any helicopter is essentially only a platform for suspended weaponry, this section is significant and deserves your special attention. If there is no suspended weaponry remove this subsection. The H-34 was developed in the early 1950s as the successor to the H-19 Chickasaw. The new helicopter was enlarged and was overall more powerful than its predecessor, yet still retained some of the core design elements, such as the nose-mounted radial engine under the cockpit. The H-34 performed its maiden flight in March 1954 and was adopted into service shortly afterwards, first with the U.S. Navy in 1955 and then U.S. Army in 1956. However, the H-34 was also widely exported and built under licence by other nations. France was one of the earliest nations to adopt the H-34, with it entering service in 1956. France initially received a large number of American-built disassembled H-34s, which were then reassembled in France. Later on, the Sud-Aviation company acquired a licence to produce the H-34s locally. In the end, close to 300 French H-34s were built and used by the French forces. The vehicle was actively used during the war in Algeria, marking the first mass use of attack helicopters by the French army. Of course, the H-34 Choctaw saw service with many more countries around the world and participated in numerous conflicts of the ‘50s and ‘60s. Although the helicopter was being phased out from military service with most operators by the 1970s, the H-34 (or S-58 if the civilian designation is used) is still being used for civilian operations today. In total, over 2,100 H-34s were built when taking into account all modifications of the type. This page was last edited on 1 April 2019, at 11:39.